Happy National Trail Mix Day, FIT BFFs! 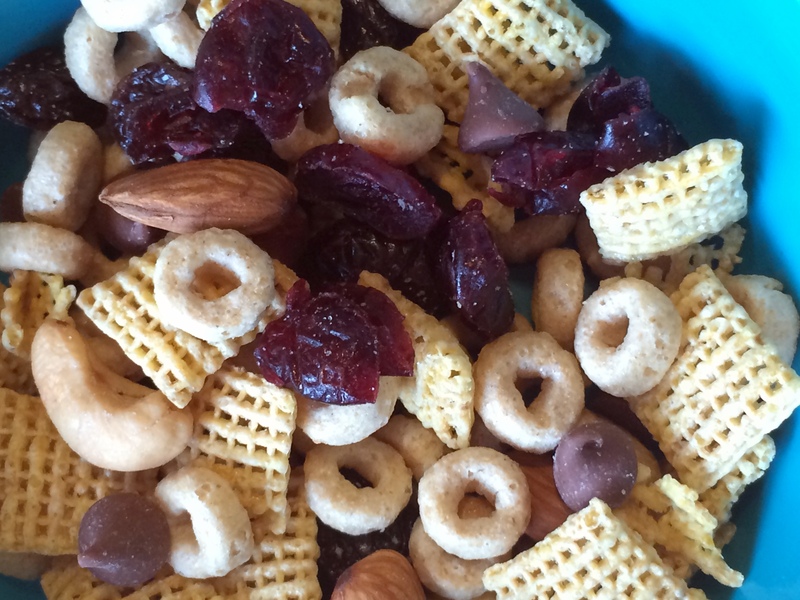 Quick history lesson…you might find it interesting to know that the concept of trail mix has been around for thousands of years. 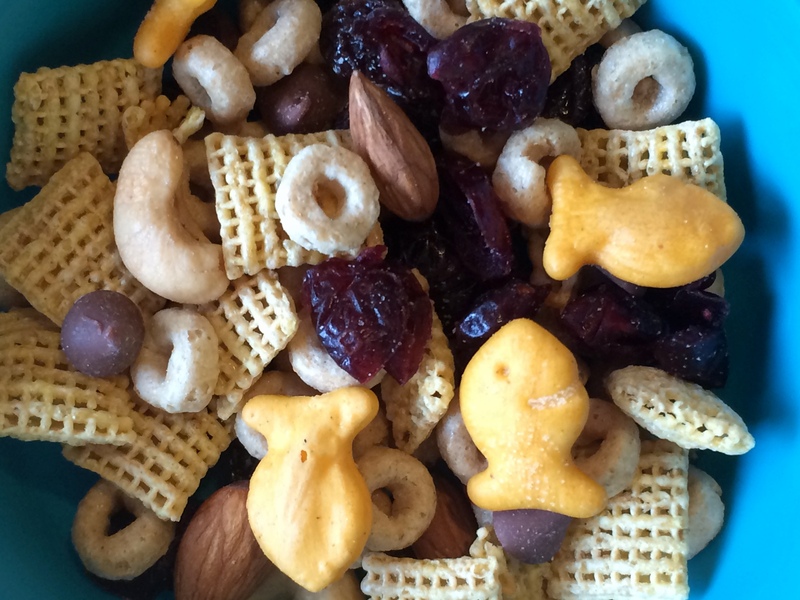 Although it wasn’t called trail mix back then, ancient hunter-gatherer tribes made use of mixing meats, nuts, dried berries and fruits together. Because they were nomadic tribes, traveling from place to place, they needed a simple food that didn’t require cooking. The bonus was that it was high in energy to help keep them moving. These days we use that same idea for hiking and other outdoor activities for the very same reasons…a simple grab-and-go snack that provides a boost of energy! 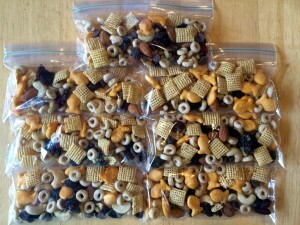 So in observance of Trail Mix Day, I thought I’d throw together a quick snack. I enlisted the help of my 13 year-old son for the “fun” of it. What he doesn’t realize, I just taught him how to add up calories, then divide to find the calorie count per serving…LOVE IT! 30 g chocolate chips…hey, don’t judge! Mix all ingredients together in medium bowl. Measure out 1/2 cup servings. 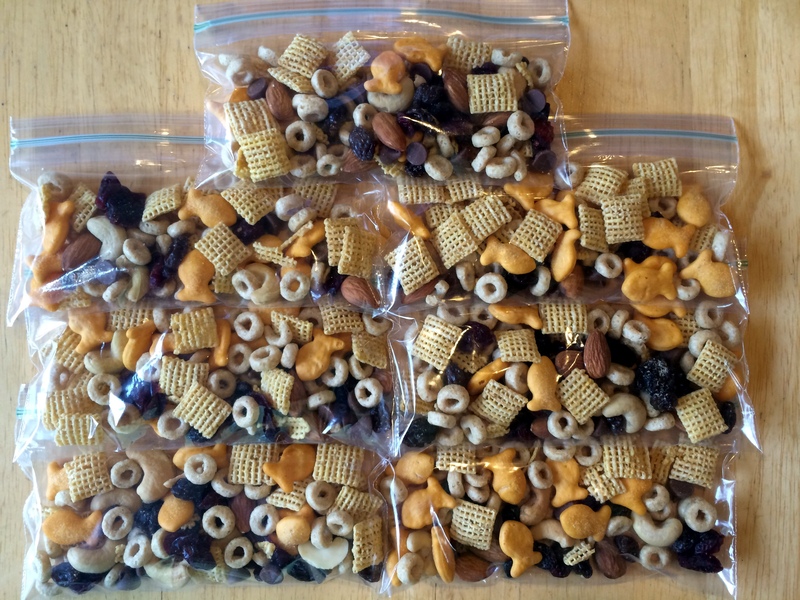 Place in snack-sized zip-seal bags for a quick convenience snack! Makes 6 servings at 160 calories per serving. 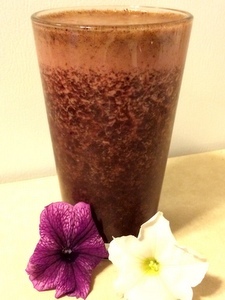 By suggestion of my teenage son, we added one of his favorite ingredients to make this what we called Even Happier Trails Mix! Note: adding 30 grams of Goldfish crackers adds another 140 calories to the entire mix, making a total of approximately 7 servings, actually bringing the calorie count down to 157 calories per serving! Bagging it up makes this a great travel snack. I’m going to throw a bunch of this together for our Labor Day Weekend activies and you can too! Just one more way to put our Best Foot Forward! I was famished following a sweaty, long run earlier this week. I knew I wanted a satisfying recovery snack or meal that would also cool me down after strenuously working out in the heat and humidity. So I did what I usually do when it’s time for a smoothie…I winged it! A quick peek in the fridge told me what I had to work with…a little of this, a little of that, and I think I’ve discovered my new favorite. Although you may find the combination interesting, I assure you, it’s packed full of refreshing flavor! Place all ingredients in a Nutri-Bullet or blender and blend until emulsified. Enjoy! 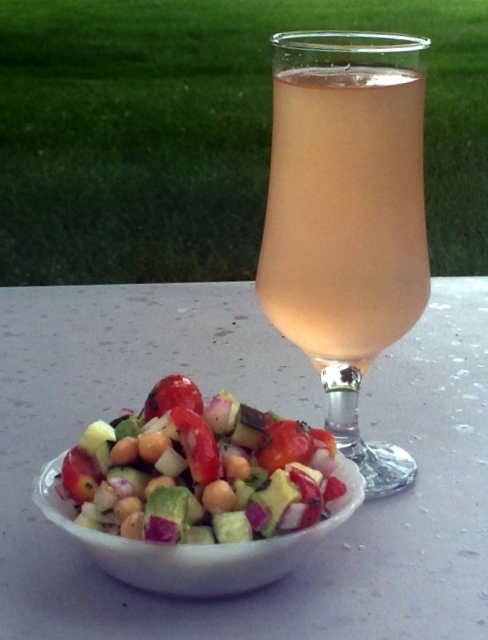 At approximately 335 calories, this is a fantastic summer option! Happy Wednesday, fellow FIT BFFs! I made a quick trip to the grocery store before lunch. This could have been a dangerous situation for me to, knowing I would soon be hungry. So I implemented my hungry-shopping strategies. I made my list (of only healthy things) before I left home, challeneged myself to stick to that list, then shopped as quickly as I could before my hunger started “talking” to me. With this mindset, I was able to successfully stick with my intentions without deviation. 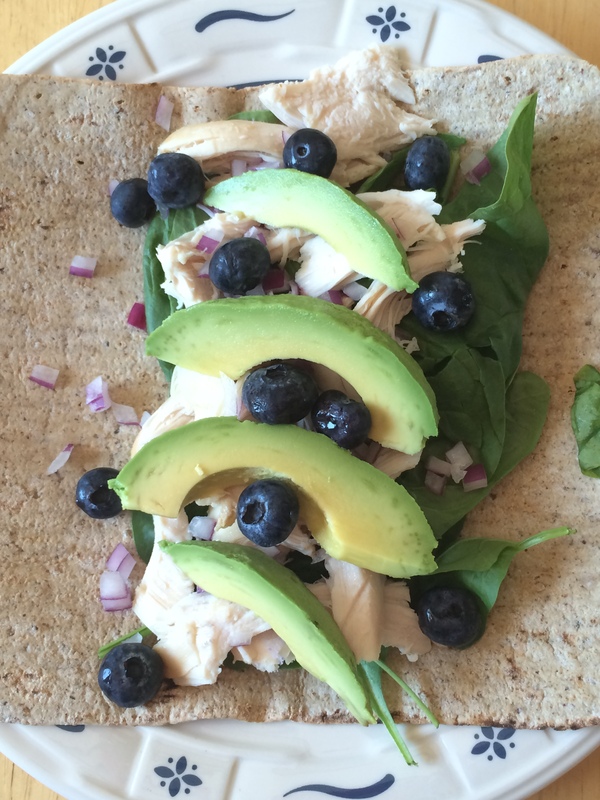 Assemble wrap in order of ingredients, roll up and enjoy! 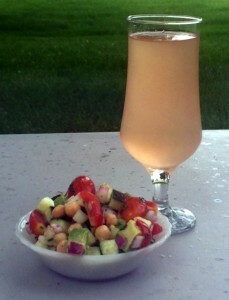 I will make this again, but may explore jazzing it up with a drizzle of BBQ or hot sauce. At a mere 370 calories, this was a quick, fresh lunch with no regret! I kind of impressed myself today. Not only did I avoid dropping some cheat stuff in the cart, despite my hunger…I didn’t stop at the drive-thru on the way home either (another “old-me” habit). Be prepared next time you venture out to the store. Have your list in hand, stay focused and get out of there! Just one more way we can put our Best Foot Forward! Happy Wednesday evening, fellow FIT BFFs! Another day has quickly come and gone for my family while vacationing on the lakes of central Minnesota. We have been fortunate to stay a week in June in and around Alexandria each year for the past 19 years. The past few have been especially memorable for me because I feel more alive than ever. With my new, healthier lifestyle, I’ve been able to more fully enjoy my surroundings. Walking, running, biking around the lake, paddle boarding, kayaking and paddle boating on the lake have all become favorites. Place all ingredients in medium bowl, gently mix. Refrigerate for an hour before serving. Optional: salt and pepper to taste. Although I have not taken time to figure out the nutrition information for this recipe, I know it is full of all things fresh, flavorful and deliciously healthy! This has become a simplified concoction I have thrown together using bits and pieces of several of my favorite recipes. This afternoon I had the opportunity to work on my Facebook Friends Resolution too! 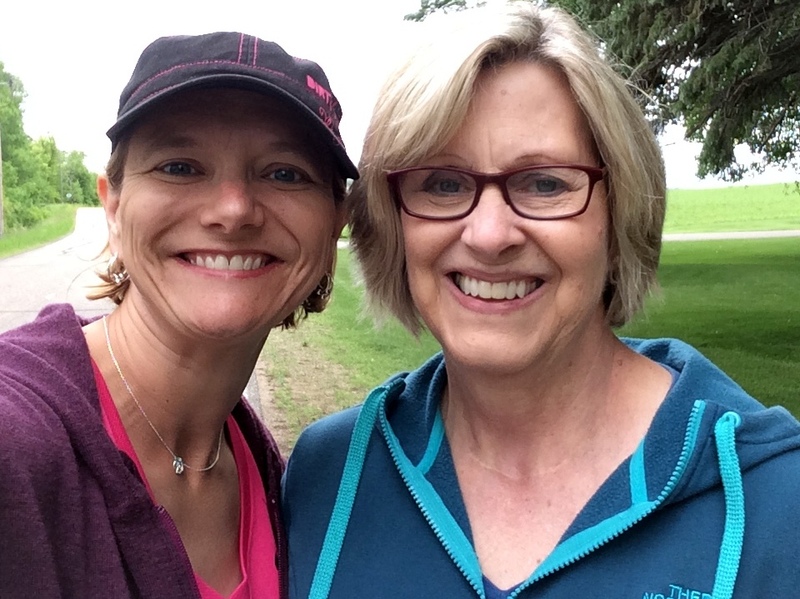 I was thrilled to join my mother-in-law Barb on a wonderful walk from our cabins on Lake Aaron, to the town of Millerville and back. My sister-in-law Abby (who ran 5 miles with me for her part in my resolution on Sunday) joined us too. Although the weather was not warm and sunny, it was not cold and rainy either. A cool, overcast day was perfect for our 3 mile walk, not to mention a great way to burn off some of those extra little calories that sneak their way in during vacation! So there it is, FIT BFFs, I’ve marked another Facebook friend off my resolution list. And you’ve got a new hot-weather recipe to whip up for a cool summer treat…one more way to put your Best Foot Forward! It’s official…as of 2 pm this afternoon, I am off for the summer! I’m organizing for two weeks of upcoming adventures and a little quick prep will assure that I stay on track. There is nothing I appreciate more for a satisfying summer breakfast than a nourishing, cool smoothie. I use my favorite seasonal fruits, spinach, coconut almond milk and a combination of dry items to add a little boost of power. 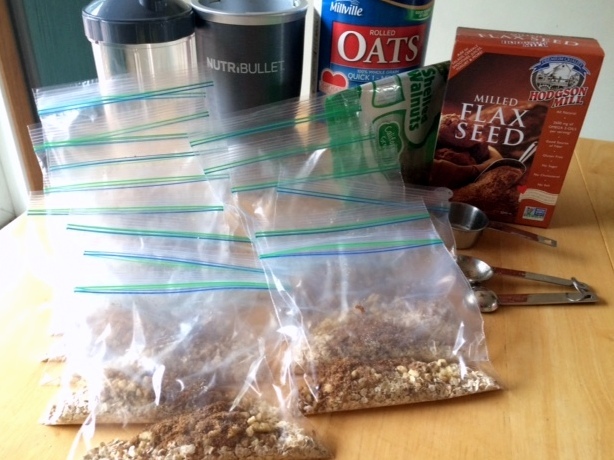 This little power boost includes 1 tbsp of milled flax, 1/8 cup walnuts and 1/8 cup rolled oats for a total of 160 calories. Measuring these items and bagging them up ahead afford me time savings and fewer larger items to take along. 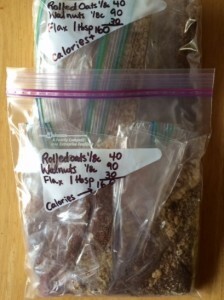 I then list the contents of each prepackaged bag on a larger bag with calorie info and pack what I need for a trip…it’s that simple! Once I reach my destination, I purchase the desired fruits, spinach and coconut almond milk…and I’m all set for success. It may not look all that great, but it’s fantastic! A super-summery way to put my Best Foot Forward…and you can too! 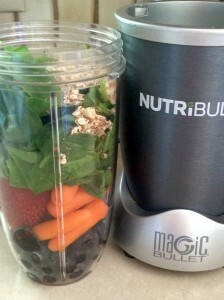 Think about the foods you rely on for success and consider how you can simplify! Want another make ahead idea? Check out how I prepackaged baked oatmeal packets here. 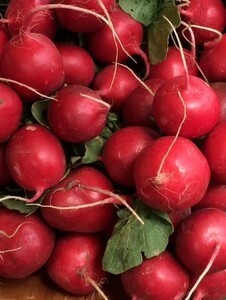 Few things energize my love of healthy eating more than a leisurely stroll through the local farmer’s market on a Saturday morning. This is a delight to all five of my senses. The colors are brilliant, the aromas inviting, the sounds friendly and informative, the tastes of samples are often tantalizing. And as far as touch goes, well, I have a hard time not picking everything up! 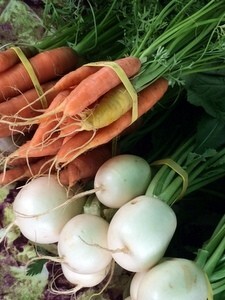 When the produce looks this inviting, it’s downright difficult to resist! I enjoy grabbing a cup of organic Guatemalan dark roast and meandering my way through the relaxed crowd and the many vendors. 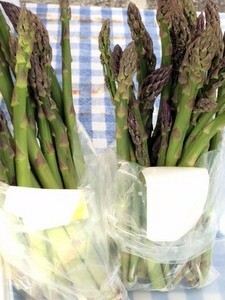 I love figuring out what I will buy for the week and dream up ways to incorporate those foods into my menu for the week. 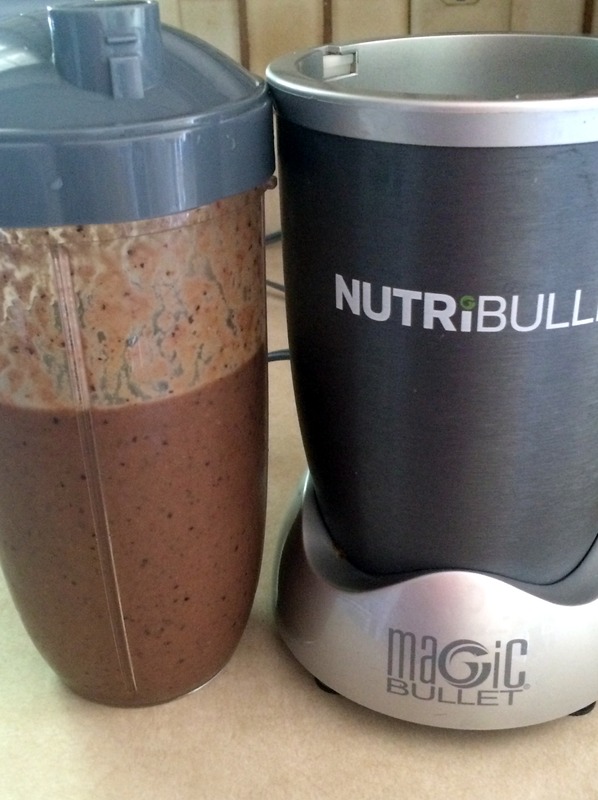 Combine all ingredients in a NutriBullet or blender and puree until smooth. 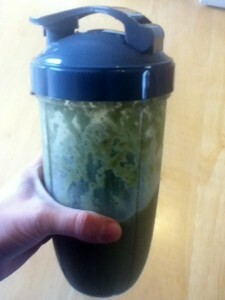 This recipe yielded a giant, energy packed serving that will keep me zinging all afternoon for a mere 360 calories! I can’t wait to figure out what to do with the rest of the items I selected this morning, nor can I wait for next weekend’s enchanting stroll through the market. 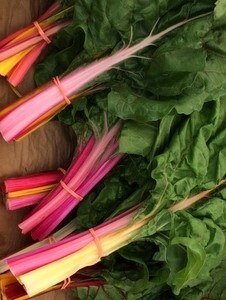 Making a farmer’s market stop has become one of my favorite changes to live this healthy new lifestyle. If you haven’t been to one lately, what are you waiting for? Eating Right For My Sight! Friends, you may not know it, but May is Healthy Vision Month. Today I am blogging for the American Macular Degeneration Foundation…the AMDF to spread awareness. According to the AMDF, macular degeneration is the leading cause of legal blindness in people over 55 in the Western world…it affects more than 10 million Americans. Someone I love has been diagnosed with macular degeneration, and it scares me! So that is why I feel compelled to share with you a simple way to help protect your vision. The AMDF has put together a cookbook Eat Right for Your Sight that features 83 easy, delicious recipes that feature nutrient rich ingredients that foster eye health. So I thought I’d quick whip up one of their recipes this morning to encourage you all to eat right for your sight. Combine all ingredients in a blender (I used my Nutri Bullet) and puree until smooth, about 45-60 seconds. Chill briefly if desired. 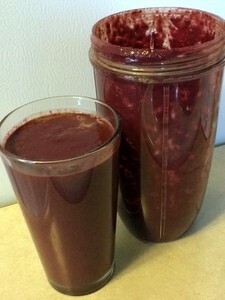 This recipe makes 2-2 cup servings at 262 calories each with 4 grams of protein, 5 grams of fiber and 1 gram of fat. This was a fantastic, tasty way for my husband and I to start our day. Today I am eating right for my sight and you can too! It’s just one more way we can all put our best foot forward! Tonight’s the night…one last dose of motivation from a show that feeds me. I hate to see it over for another season, but will enjoy every last minute of The Biggest Loser Season 16 Finale tonight. In honor of the emotion-filled, impressive transformations of the contestants, I thought I would put a little of The Biggest Loser on my dinner table tonight. 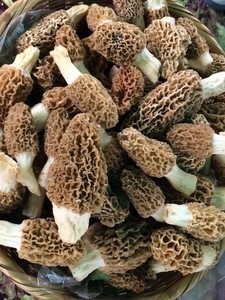 I’ve made this recipe before and although my kids turned their noses up at it, my husband really enjoyed it and I found it absolutely delicious and well within my calories for a filling portion. The one thing I found tricky was serving it, as it had a sloppy consistency. 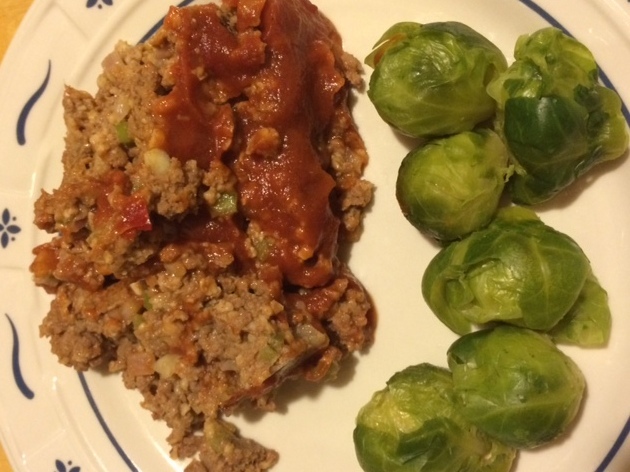 It could easily be served on a bun or sandwich thin as a regular sloppy joe. This is going to make AWESOME leftovers tomorrow! You’ll find The Biggest Loser Sloppy Joe Meatloaf recipe here: http://www.biggestloser.com/lifestyle/recipes/sloppy-joe-meat-loaf And while you’re on The Biggest Loser website check out all the other amazing recipes there; it’s a great place to find some new favorites! Tune in tonight on NBC at 8/7 central for some terrific inspiration! After giving my strength training workout everything I had this morning at the gym, I felt like treating my body to a nourishing new recipe. I’ve been intrigued by quinoa and have enjoyed it in several dishes at restaurants, I figured it’s time I give it a whirl at home. 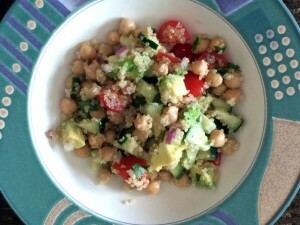 Perusing the many quinoa recipes on my favorite light and healthy recipe website skinnytaste.com, I found one I couldn’t wait to sample! 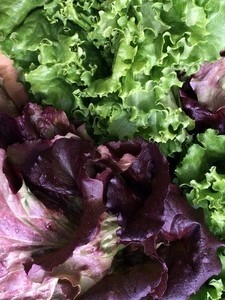 I love this website because the author, Gina Homolka has made cooking healthy a snap. Not only does she have concise, step-by-step directions, she includes beautiful photos of each recipe. And my favorite part, nutrition information is included along with serving sizes so eating healthy becomes a no-brainer! Gina has published an incredible looking new cookbook in 2014 entitled The Skinnytaste Cookbook…guess what’s going in my amazon cart? Why not take a look around her website, you are sure to find something you’ll want to try too! It happens every now and then…I don’t know what I want to eat, so I rummage through the cupboard and fridge to find a couple things to throw together as a new concoction. Sometimes it results in something less than awesome, other times it’s a downright epic-fail. But I keep trying, because every now and then I stumble upon a new favorite…that would be this sandwich! Experimenting with foods has been key in my long-term weight-loss success to prevent boredom. I was a bit leery about how this would turn out, but I have to say it belongs on the menu at Panera! It is the kind of thing I would order again and again! Next time you are not sure what you are hungry for, take a look in your cupboards…you might just have the fixings for your next favorite creation! 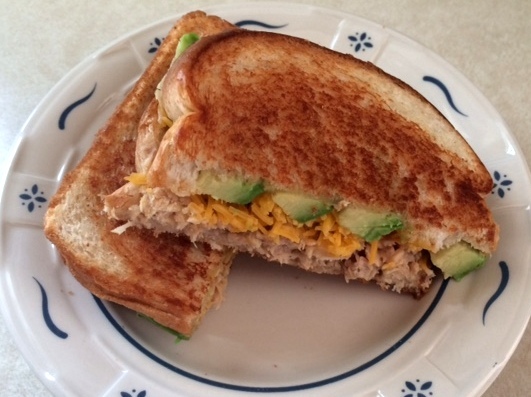 So here’s my Salmon Avocado Cheddar Melt…a heart-healthy Omega 3 hit! Spread each slice of bread with 1/2 tsp coconut oil. Place one piece of bread oil-side down in a frying pan. Layer salmon chunks, shredded cheddar and avocado on top of the bottom piece of bread. Cover with the other piece of bread, oil-side up. Cook on low to medium heat until bread is a golden brown, flip sandwich to brown the other side. Enjoy! Makes 1 very filling serving at 388 calories or share this tasty heart-healthy winter treat with a lucky loved one for 194 calories per half sandwich!